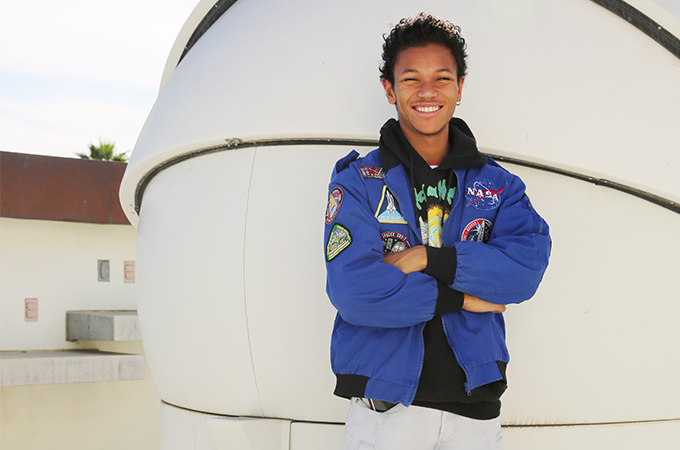 Originally from Pomona, California, Anthony Razo ’21 arrived on the University of Redlands campus and wanted more club options for science students—so he decided to take matters into his own hands. Razo, who is an engineering student in the 3-2 program, sat down with the Bulldog Blog’s Katie Olson to talk about how he became interested in rockets, why he wanted to start the club, and his vision for the group. Bulldog Blog: Why did you want to start a rocket club? Anthony Razo: When I first got to the University of Redlands, I felt students’ main options in terms of STEM-oriented organizations outside of class were the math club or the physics club. I wanted to see what else we could do. I asked, “What if we had a rocket propulsion club?” People seemed to be open to the idea, so we started one. BB: What’s the name of the club? AR: The Redlands Rocket Propulsion Club. Our advisor is Professor Martín Hoecker-Martinez. BB: How did you become interested in science and rockets? AR: I was interested in space exploration from a very young age. But during my sophomore year of high school, one of my teachers introduced us to the Student Spaceflight Experiments Program, created by the National Space Council and NASA, that allows students from different schools to compete in designing a research experiment. For our project, we researched the effects of zero gravity on microscopic organisms, and it was eventually selected to fly to the international space station. Our mission was CRS-7, a SpaceX mission that exploded on the way to the station, and we had to do the project over again for CRS-8. But now my friends and I have a project in space! That whole project made me want to keep learning about the field of space exploration. BB: What’s your vision for the club? AR: I’m hoping that people in the club will be able to get a better sense of what’s going on in the world of aerospace and engineering. We’ll look at current designs and proposals and watch videos posted by different aerospace companies, such as Northrop Grumman, Boeing, SpaceX, and Jet Propulsion Laboratory (JPL), to see what they’re doing. We’ll also design and launch small rockets. In addition to being a rocket club, the group focuses on what it’s like to be an engineer. BB: How was the process of starting a club? AR: It has sometimes been frustrating, but I’m really excited for us to be recognized as an official club and receive funding and other resources from the University. Right now we have about 15 people who want to be in the club, and they’re really eager to start official meetings. BB: Is the club only for engineering majors? AR: It’s mostly made up of engineering majors, but there are a couple people who are just interested in space and rockets. Anyone can join—they don’t need to be a math or science major. If you are a student interested in joining the Redlands Rocket Propulsion Club, contact Razo, anthony_razo@redlands.edu. For general information on clubs and organizations at the University of Redlands, see the Student Involvement and Success web pages.